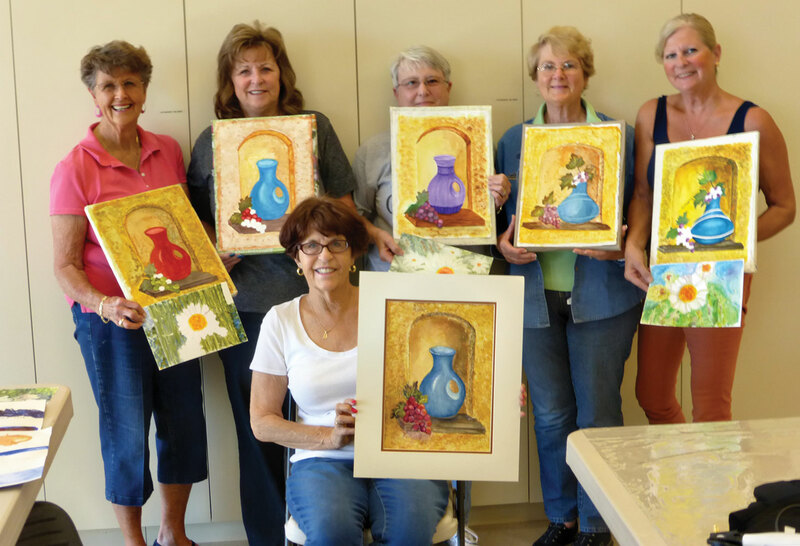 Maxine Harrison, watercolor artist, taught a two-day workshop (three hours each day) at the Creative Arts Center March 4 and 6. Maxine teaches at Robson Ranch usually twice a year, November and March. The cost for the class is $70 and includes the watercolor paper needed. The only extra supplies needed are limited to four tubes of paint, three brushes and a few miscellaneous items. Mixing colors with a limited palette is one of several exercises you practice. Ability to draw is not necessary as Maxine furnishes the students with the patterns before the class so they are able to trace it onto the watercolor paper. Focus is on watercolor skills, not drawing. If you’ve never painted before, you will be very pleased to discover what fun watercolor painting can be and be proud of your finished pictures. If you have had other watercolor classes, Maxine will expand your abilities. To be on the list for future classes, please add your name and contact info on the list in the binder at the Sports Center desk. When a class is scheduled Terry Price will contact you in order of your name on the list. The class is limited to eight students. ← April – in like a lion and out like a lamb?